Hi guys, today I’m going to share the latest skin products that I’ve been trying: Olay Miracle Duo range of skincare. I’ve shared before that after my second pregnancy, my skin suffered some breakouts due to the hormones, and I’ve been trying to find the best skincare to heal my skin. 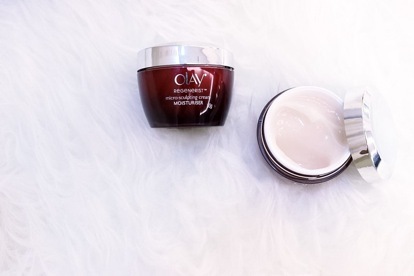 I’m now using the Olay Regenerist Micro-Sculpting Cream to tighten up my pores and firm up my skin. You’ll feel the difference after just one day of use. Used regularly, the products promise results of youthful, smooth and radiant skin. I’ve used it for a few days and I have certainly felt that my pores have tightened up a bit and that my skin is more firm and supple. I have been using the night version of this range in my previous blogpost 3 Tips to a Youthful Skin I quite liked the result so I continued with their morning version too. 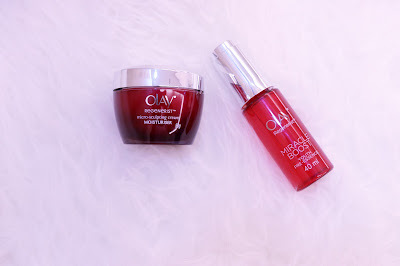 Together with the Olay Regenerist Micro-Sculpting Cream, I’m also using the Olay Regenerist Miracle Boost Youth Pre-Essence. It is supposed to boost your skin’s metabolism and activate the anti-ageing ingredients of the Olay Regenerist Micro-Sculpting Cream, hence it’s called the Miracle Duo. The skincare regimen is quite easy and pretty straight forward. Just use it one after another and you’re done. Skincare is important no matter how old you are. After you reach your 30s, the skin’s self-healing properties begin to slow down and you will notice lines and wrinkles that weren’t there before slowly creeping in. That’s why it is very important to take care of your skin for yourself. It’s never too early to begin a daily skincare regimen and using the award winning Olay Miracle Duo helps to improve my skin. I’ll just add that what I love about these products is how they absorb into your skin fast and smell great too. It’s not greasy or oily and will not leave a stain, especially if you’re wearing a scarf like me. Anyway, I hope that short and simple share today is beneficial to you. If you have any questions, feel free to shoot away! Visit https://www.everydayme.com.my/olay for more info! wow , first time i heard that the creams have 2 versions night and day , as I am a boy so I don't know about such products really but i would recommend it to girls i met in my daily routine of life , because i saw ur face its really shining and clear , it is not only because of this cream but u r actually beautiful !! and we have the services of gift shop in malaysia do visit us , you might like our products if whenever you or your friends wishes to send gifts to your near and dear ones !! Oly is the best beauty cream for all age type of women. You can buy beauty products at discounted rate. Best set of beauty cream.